In the beginning, there’s only darkness. The odd sounds of metallic moaning and creaking clockwork fade into the ambient silence of the workshop. Pipes riddle the many corners like cobwebs, littered televisual monitors flicker and throw out strange images, like the withering images of a past fever dream. The structure of the complex, long since warped by the residual radiation of the compound Innovatium – theorised to be the physical manifestation of pure imagination – has long since passed euclidean geography, so that one door can lead to more than one room, or to a different reality. It is in one particular room, accessible only through the humming of an unordinary tune, that the Doctor lies. The room is bare, akin to the padded dwellings of a mental institution, except twice as large. In the very centre, a reclining seat, like an electric chair without the devices, supports a gangly, tall figure. In it’s gnarled, gloved hand, the solitary light reflects oddly on the quivering droplets scattered within the otherwise empty glass. The figure’s attire is reminiscent of a Neo-Victorian aristocrat; a red, patterned waistcoat over a long-sleeved white shirt, black trousers sprouting into black shoes, goggles with red and blue lens resting on a gaunt, unshaven face. As the viewer takes in further details, they would notice the strange scribbles on the walls, of bizarre creatures and quasi-religious beings, in paints and colours that seemed to contradict each other. It is said that to understand the mind of one that wonders beyond the walls of human understanding, one must leap past that wall and meet them along the way. The paintings, as the viewer takes in the perspective of the near-comatose figure, begin to peel off the walls, their colours blending with the air, until the creatures have blended into one, gaseous cloud of colour that morphs into other creatures; stick figures, cats, dogs, six-legged pirates, purple elephants, polkadot-tailed cetaceans, eventually going beyond any comparable lifeform and into the realm of subconscious dreams and nightmares. To look upon these beings in vivid detail would drive a human mad, though it seems that the figure had already passed this point a long time ago. A quarter-hour passed as the ethereal images grew wild and colourful, to the point where no word in the human language could possibly describe the panorama other than a sea of colour and radiant lights, and the sensation as gently falling forwards whilst remaining in place. And in the midst of this psychedelic light-show, the slumped figure remains completely still, staring dead ahead as if his mental destination lies before him. Then, after another quarter-hour, the alien colours and bizarre figments coalesced into an incandescent white light that purged all shadows in the room, as well as all outlines which separated the walls and the floor and the ceiling. The figure leans forward, his before vacant face now uncurling into an anticipating grin, his features melting before the light. 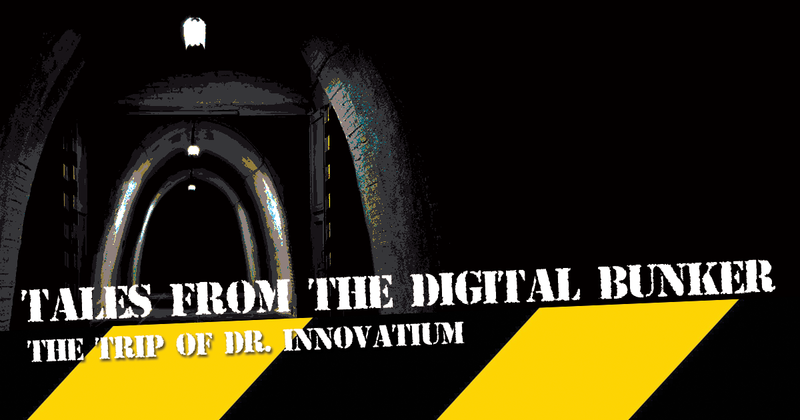 Each trip into the Imagiverse ended with the light, Dr. Innovatium had observed. In each of his writings after ingesting the substance that was his namesake, he found it impossible to describe what it was, or what it meant. What he could remember, though, was the sensation of utter bliss, a rarity in more commonplace psychedelics like LSD or marijuana, which were only crude gateways into the subconscious realm. it, live by it, die by it. It was his destiny to explore the fantastic realm and record it for those who dare follow his footsteps, to pick up from where he left off, and chase the dream to the very corners of the human psyche. The light, as suddenly as it appeared, went out. In the meantime, there’s only blackness.